Development Index) build a GNH forum and create awareness of the concept among the youth. signing of project on December 8 in Thimphu. priorities in terms of resource allocations in the 10th and subsequent plans while the index will be a benchmark for good governance and for pursuing holistic development goals,” he said. The forum, Lyonpo Jigmi Thinley said, will begin with members of the Bhutanese delegation to the second GNH conference in Canada and slowly reach out to other national and international experts, thinkers and practitioners. “The Bhutanese delegation to the international conference on GNH in Canada returned home overwhelmed by the interest and the importance given to the concept,” said Lyonpo Jigmi Thinley. “Unless we take the concept seriously and apply it in specific policy and planning situations, it may remain attractive both at home and abroad only as an idea,” he said. Lyonpo Jigmi Y Thinley said that it was important the youth of Bhutan had a good understanding of GNH and the new political system which will be introduced once the Constitution is adopted. “The project will enhance awareness among the youth through national youth meetings which will be attended by hundreds of students from middle secondary schools to tertiary educational institutions around the country,” he said. The UNDP is funding US$ 325,000 for the project and the Centre for Bhutan Studies (CBS) has been assigned to establish the indicators of well-being by 2006 and the index of GNH by 2007. 2005, December 9: The United Nations Development Programme is providing0.325 million US dollars to the Royal Government to operationalize GrossNational Happiness (GNH). The money will be used to establish GNH indicators, institutionalize forumon GNH and begin GNH advocacy amongst youth. It is a two-year project. This project will help incorporate the concept ofGross National Happiness into the day-to-day policy making of the RoyalGovernment of Bhutan. 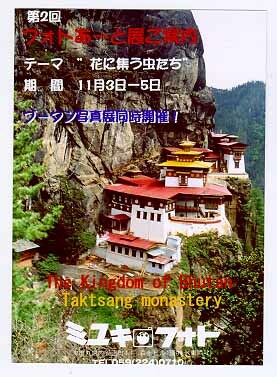 The Center for Bhutan Studies will implement the project in coordinationwith the respective ministries and agencies. UNDP will support in obtaininginternational expertise and inputs for the GNH forum. The agreement was signed by the Resident Representative of the UNDP Ms.Renata Dessallien, the Director General of the Department of Aid and DebtManagement, Sonam Wangchuck, and the Director of the Center for BhutanStudies, Karma Ura, in the presence of the CBS President, Lyonpo JigmeThinley. The Minister of Labor and Human Resources, Lyonpo Ugyen Tshering and othersenior Government officials also attended the signing. 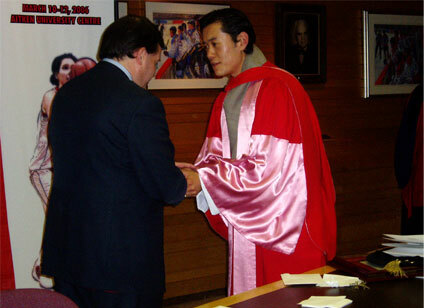 2005, October 20: His Royal Highness Trongsa Penlop was conferred the Honorary Doctorate of Law degree by the University of New Brunswick. His Royal Highness received the award at the 51st fall convocation Thursday. Addressing the Convocation, His Royal Highness said the award symbolizes goodwill that exists between Bhutan and Canada. His Royal Highness said the honorary degree was a tribute to the dedication and commitment of many Bhutanese who studied at the University. Also addressing the function, the president of UNB said the University was deeply honored to bestow the honorary degree to his Royal Highness. 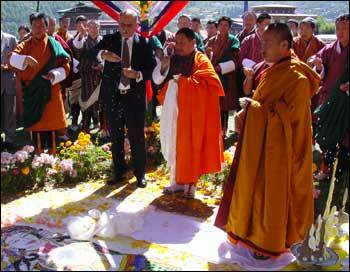 This he said signifies the partnership between Bhutan and the University. Our reporter Dawa in New Brunswick said the Honorary Degree recipients over the years include many world leaders including President John F. Kennedy, Senator Kennedy and the late father William Mackey in 1994. Following the ceremony the Board of Governors of the university hosted a lunch in honour of Penlop coinciding with the 10th anniversary of Father Mackey’s passing away. As part of the 20th anniversary of UNB’s partnership with Bhutan, the president announced the creation of the Father Mackey Fellowship. The fellowships, which carry 15,000 Dollars per year, will be awarded to senior civil servants and business leaders from Bhutan. Bhutanese students studying at the University told BBS that they were privileged to meet the Crown Prince. They said it was an honour to attend the function where HRH was conferred the honorary degree. Our reporter says the students came in gho and kira, which he said made the Fredericton resound like a small Bhutanese village. Many international foreign students and Professors of the University said that Bhutanese should honored for what His Royal Highness has been conferred. His Royal Highness also hosted a dinner for all the Bhutanese students at the Delta Fredericton Hotel. The students also performed Bhutanese dances where even the Penlop took part. According to a news release from the Permanent Mission of Bhutan to the UN the visit is expected to further strengthen Bhutan Canada ties. 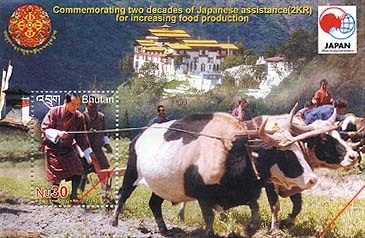 Diplomatic relations between Bhutan and Canada were established in June 2003. 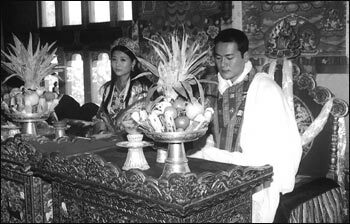 Thimphu 15 October 2005 - Her Royal Highness Ashi Chimi Yangzom Wangchuck, the oldest of the royal children, was married to Dasho Sangay Wangchuck at the Dechenchholing Palace on October 13, the 11th day of the ninth Bhutanese month. His Majesty the King, Their Majesties the Queens, and family members were joined in the traditional ceremony by Cabinet ministers, senior military officers, and representatives of the international community. Her Royal Highness, who completed a bachelor’s degree with double majors in international relations and economics from Wellesly College in Masachusettes and a master’s degree in public administration from Columbia University in New York, is interested in working with youth. Dasho Sangay Wangchuck, whose family belongs to the first generation of Bhutanese industrialists, is currently completing a master’s degree in public administration and global affairs at Colimbia University. He told Kuensel that he would like to serve his government and his country in the best way he can. Thimphu 15 October 2005 - In a significant step to prepare for a democratic system of governance with the enactment of the Constitution, the groundbreaking ceremony of the National Council building was conducted on October 13. Gyalse Tenzin Rabgye performs the salang thruesoel ceremony The ceremony was presided by Trulku Gyalse Tenzin Rabgye and attended by the Prime Minister, Lyonpo Sangay Ngedup, cabinet ministers, the royal advisory councillors, senior government officials and dignitaries from international agencies. Located adjacent to the National Assembly building in Langjuphaka, the new building will house the members of the council, with separate chambers for the council members, and public and press galleries, according to officials of the department of urban development and engineering services which is undertaking the project. According to the draft Constitution the National Council, referred to as the Upper House in some parliaments, will comprise 25 members, 20 of them elected from the 20 dzongkhags and five eminent persons nominated by His Majesty the King. The National Assembly secretary, Jigme Zangpo, explained that the Council members will be independent of the political parties. “This makes the National Council an important body to provide a check and balance in the functioning of parliament,” he said. All legislation enacted in the National Assembly will have to be put up to the Council for their consent, he said. “The Council, without political party influence, represents people from the grass-roots level whenever a bill is passed or a convention is signed,” he said. Besides it legislative functions, the National Council will also act as the house of review on matters affecting the security and sovereignty of the country, the interests of the nation, and the people that need to be brought to the notice of the King, the prime minister and the National Assembly. Thimphu 15 October 2005 - The construction of the Supreme Court of Bhutan, the highest appellate authority for appeals on judgments, orders, and other decisions of the High Court on all matters, will begin over the coming months on three acres of land in Hejo, Thimphu. The salang (groundbreaking) ceremony for the construction was conducted by the Tshennyi Lopon of the central monk body, on October 13, attended by a gathering of senior government officials, court officials, and representatives of the Indian embassy. Addressing the gathering during the ceremony the chief justice, Lyonpo Sonam Tobgye, said that Bhutan was “scaling new peaks, conquering new horizons, and finding new milestones”, and the construction of the Supreme Court was such an achievement. “The voice from this edifice of the guardian of the Constitution will resound the commitment to justice,” he said. The chief justice conveyed Bhutan’s appreciation to the government of India which has committed the funds for the construction of the Supreme Court building. The Indian ambassador to Bhutan, Mr. Sudhir Vyas, said that India was proud to be associated with such a prestigious project, the construction of the apex court of Bhutan as part of the bilateral cooperation programme through which India had committed over 19 billion Rupees in the Ninth Plan. The Supreme Court, presided by the Chief Justice will have four drangpons, appointed by His Majesty the King from among the drangpons of the High Court or eminent jurists. In the absence of the Supreme Court, appeals against High Court decisions are made to His Majesty the King and are often investigated by the Royal Advisory Council. Thimphu 15 October 2005 - Residential quarters to house ministers and Constitutional post holders will be built on a 15- acre area in Motithang, Thimphu. According to officials of the National Housing Development Corporation, about 13 acres would be used to build residences for ministers and the rest for the Constitutional post holders. “In total, about 20 residential quarters will be built,” said the managing director of the housing corporation, Phuntsho Wangdi. The ministers’ residential complex was to accommodate the prime minister, two speakers of National Assembly and the Parliament, two chief justices of High Court and Supreme Court and ten other ministers. The Constitutional Post holders complex was to house the chief election commissioner, auditor general, an attorney general, chairman of royal civil service commission and the chairman for anti-corruption, housing officials said. The corporation had already submitted a preliminary estimation of 500 million ngultrum to the finance ministry. The groundbreaking ceremony for the project, which was started in a year ago, was held on October 13. The Office of the Census Commissioner has announced a slight change in the dates for conducting the Population and Housing Census 2005. The nationwide Population and Housing Census will be conducted on the 30th and 31st of May and not on the 29th and 30th as announced earlier. The dates have been changed so that the enumerators can reach the designated places on time. The Office of the Census Commissioner says that people need not go to their respective Gewogs for the census. They will be enumerated in the place they are on that day. If a member belonging to a household in Mongar is away in Gasa, he or she will be enumerated in Gasa. The nationwide Population and Housing Census 2005 will be held on the 29th and the 30th of this month. The Census Commissioner Dasho Dr. Sonam Tenzin told BBS that the royal government has decided to conduct the nationwide Population and Housing Census on the 29th and 30th of May. The royal government has also decided to declare the two days as public holidays. He said all government offices, schools, and institutions will remained closed during the two days. 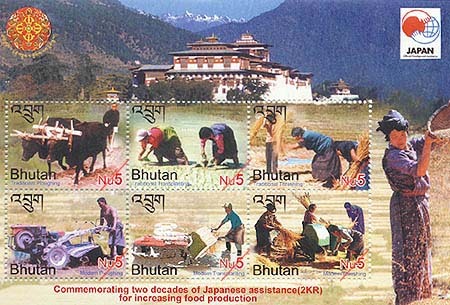 The Population and Housing Census of Bhutan 2005 will completed within these two days. The next nationwide census will be conducted after 10 years. Meanwhile, the Office of the Census Commissioner has almost completed the census mapping and house listing. It will facilitate the nationwide Population and Housing Census. The mapping is being done using the Geographical Information System (GIS) Software. This will be followed by census enumeration sometime in May. The enumeration will be done using the De facto method. This means the people will be enumerated according to the place where they are found on the census day. The six-page questionnaire will seek information about education and health, employment, and ownership of housing to the availability of toilet facility among others.